When people talk about tooth erosion, they refer to the wear of the outer layer of the teeth, called enamel. In addition, when this erosion occurs continuously, it can expose the dentin, the tissue that is under the enamel and causes tooth sensitivity, because this layer is more sensitive to contact with external stimuli (cold, heat, acids, etc.) than enamel. Dental erosion is the progressive loss of dental enamel, associated with the contact of this with acids not produced by bacteria. 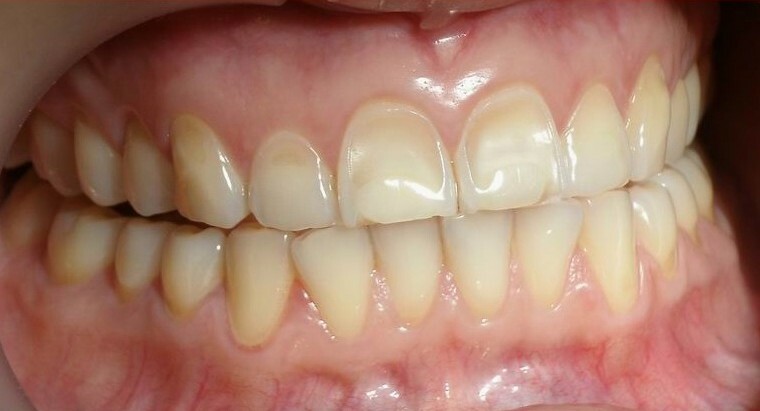 Its process is similar to that of caries, although in this case, it is an enamel lesion susceptible to wear and resistant to remineralisation. This is why establishing a prevention protocol and knowing what treatment is necessary are key factors to stop the loss of dental tissue. These simple tips will help you avoid enamel wear and, therefore, dental sensitivity. The best option is to eliminate the consumption of acidic, gaseous and sugary drinks, but in case of not wanting to apply this rule, it is advisable to consume them not to keep them in the mouth so that their contact with the teeth is the least possible and they do not attack the enamel. Milk or cheese, among others foods, can help to neutralize the acid that remains in the mouth, so it is advisable to consume them at the end of the meal. These foods will help neutralize the bacteria’s acid, so this helps preserve the dentin layer of the tooth enamel. It is also advisable to try and avoid acidic foods at the same time. They help to increase the amount of saliva in our mouth, and saliva nullifies the acids that remain in our teeth after eating. It is recommended not to ingest any drink or food during the following half hour to before you brush your teeth. In addition, you should brush our teeth 3 times a day for 2 minutes. Increase the resistance to acids through fluoridated therapy: it has been shown that the erosive effects of acids can be minimized with the application of fluoride both in varnish and with topical application. Use a daily oral hygiene treatment with fluorinated pastes and mouthwashes and containing hydroxyapatite nanoparticles at a specific concentration, since they have been shown to help prevent tooth erosion. Use of calcium and phosphate to increase the resistance of acids: calcium and phosphate significantly reduce the erosive potential of several acidic agents. There are also brushes that are specially designed for gentler cleaning too.